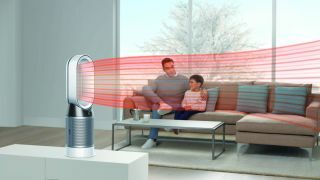 Dyson has announced the launch of its new air-purifying fan heater, the Pure Hot+Cool, aimed at keeping your home warm in the winter, cool in the summer, and your air purified through all the seasons. The new fan heater detects airborne particles and gases, which then come up on its LCD screen and Dyson Link app, so you can monitor the levels of air pollution in your home in real-time. It uses lasers to identify fine particles in the air, as well as sensors that monitor volatile organic compounds like nitrogen dioxide and formaldehyde, which can cause cause watery eyes, burning sensations in the nose and throat, coughing, nausea, and skin irritation. You may be wondering how these chemicals get into your home in the first place. According to Dyson, 'pressed wood' (material made by bonding wood shavings under heat) can release formaldehyde. Tree pollen, meanwhile, can easily find its way into your house through open windows and vents, which is bad news for hay-fever sufferers. In fan mode, it keeps you home cool by deliver a powerful stream of purified air, and with a range of 350 degrees, you can pretty much sit anywhere and still feel cool. As of today the Dyson Pure Hot+Cool is available to buy in the UK from Dyson stores for £549.99 – not cheap by any stretch of the imagination, but if you're worried about indoor air pollution, it may be worth the investment.